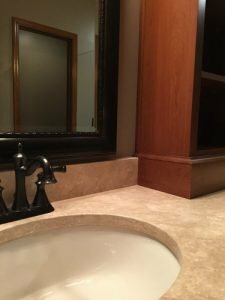 In the vanity area, we replaced the existing vanity with a Woodstar vanity base and tower cabinets. This gives the homeowner more storage, and the Derby-style door is a sleek and modern update. The counter top is limestone with undermount porcelain sinks. We also updated the floor, moving from laminate to a lovely and easy to clean Alaska tile in Blackburn. One of the biggest changes we made was converting the existing bathtub to a large custom shower. The frameless shower enclosure has gorgeous oil-rubbed bronze fixtures, and we used Alaska tile in Klondike for the walls. The shower floor is a smaller Alaska tile in Blackburn. We also included a travertine seat for added convenience. This shower space looks stylish and is also more functional for the homeowners. In addition, we took an existing small shower and converted it into a linen closet to add storage space. The end result is a bathroom that is modern, but also offers plenty of storage and a generous shower area. 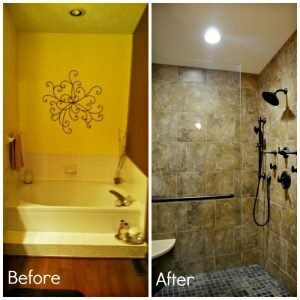 We were able to make updates that not only improved the look of the space, but also made it more useful for the homeowner. I am thrilled with the result, and our client loved it, too! 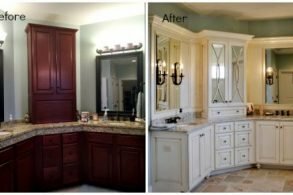 If you’d like to see a similar transformation in your home, we’d love to work with you. 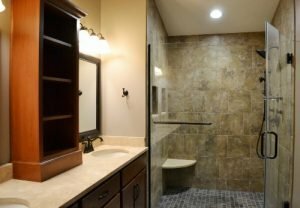 We can maximize your space and give you tile, fixtures, and cabinetry that you’ll enjoy for years to come. To learn more, contact us or stop by our showroom. You can also follow our seminar schedule for free educational events designed to answer your questions and help you learn more about the renovation process. Whatever your needs, we can help you find a solution that improves your home and simplifies your life. Big Home Remodel Challenge: Too Many Choices and Decisions to Make!